It was a hot day in paradise for the AFC-NFC Pro Bowl on February 1, 1981. There were 50,360 fans in attendance at Aloha Stadium in Honolulu for the second straight game in the annual NFL all-star series to be played at that locale. Head coaches were Atlanta’s Leeman Bennett for the NFC and Sam Rutigliano of the Browns for the AFC, whose teams had reached the Division playoff round in their respective conferences. The contest quickly turned into a defensive struggle. Detroit rookie Ed Murray’s 31-yard field goal put the NFC in front and was the only score of the first quarter – he also missed from 37 yards (Murray pictured above). 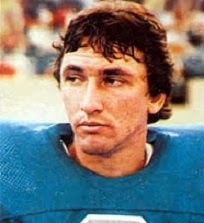 In the second quarter, Cleveland QB Brian Sipe connected with WR Stanley Morgan of the Patriots for a nine-yard touchdown. New England’s John Smith added the extra point and the AFC led by 7-3. Later in the period, turnovers by the AFC led to Murray field goals of 31 and 34 yards to put the NFC back in front by 9-7 at the half. The first was set up when Dallas DT Randy White recovered a Sipe fumble and the second came after CB Joe Lavender of the Redskins intercepted a pass on the next series. The game remained close following a scoreless third quarter, but in the fourth quarter QB Steve Bartkowski threw a perfect pass to his Atlanta teammate, WR Alfred Jenkins, who pulled in the ball without breaking stride at the AFC 45 and continued on down the sideline for a 55-yard touchdown. Murray added the extra point to expand the NFC lead to 16-7. The touchdown had been set up when LB Jack Reynolds of the Rams stopped Buffalo RB Joe Cribbs for no gain on a fourth-and-one play. The situation repeated itself later in the final period after the AFC drove deep into NFC territory, and with the exact same result as Reynolds stuffed Cribbs on fourth-and-one. Once again it led to points for the NFC, with Murray booting his fourth field goal from 36 yards. The NFC picked up another two points when OT Art Shell of the newly-crowned league champs, the Oakland Raiders, was penalized for holding in the end zone. Murray had a chance to tie Garo Yepremian’s single-game Pro Bowl record for field goals of five, but his attempt from 37 yards with 22 seconds remaining in the game hit the crossbar and was no good. It was inconsequential to the outcome as the NFC won for the fourth straight year by a final score of 21-7. The NFC had the edge in total yards (357 to 229) and first downs (20 to 12). The AFC gained just 65 yards on 22 running plays. The AFC turned the ball over four times and also was penalized on 9 occasions, at a cost of 74 yards, in the error-filled game, while the NFC was flagged 10 times for 60 yards. Steve Bartkowski completed 9 of 21 passes for 173 yards and a touchdown. Philadelphia’s Ron Jaworski was successful on 6 of 16 throws for 47 yards. RB Ottis Anderson of the Cardinals was the top rusher with 70 yards on 10 carries. With the long scoring reception, Alfred Jenkins, a late roster addition replacing WR Tony Hill of the Cowboys, led the pass receivers with 91 yards on three catches. Another Falcon, RB William Andrews, also caught three passes, for 17 yards, to go along with his 10 rushing attempts for 39 yards. 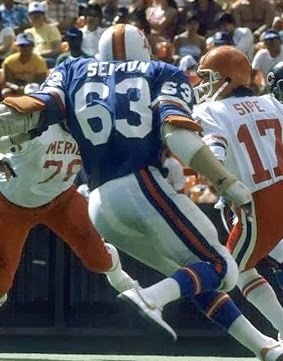 Defensively, Tampa Bay DE Lee Roy Selmon (pictured below) and DT Randy White of the Cowboys were especially effective for the NFC, with Selmon logging two sacks and four tackles. Brian Sipe had 10 completions in 15 attempts for 142 yards, but tossed two interceptions and fumbled the ball away once. Dan Fouts of the Chargers completed only four of 15 throws for 53 yards. The NFL’s top rusher, RB Earl Campbell of the Oilers, was held to 24 yards on 8 carries. John Jefferson was the AFC’s top receiver with three catches for 48 yards. Murray was the first placekicker to be named the game’s Most Valuable Player since Garo Yepremian in 1974. The Canadian kicker would go on to play a total of 19 years in the NFL, mostly with Detroit, and was named to the Pro Bowl after one other season.